All I've wanted to do all day is fall into a deep, undisturbed sleep. Now that I finally can, I can't. So I've been listening to music. First, I heard a song on the country station, but it didn't sound like country. And it was really good. And it sounded an awful lot like Dave Matthews, but why would Dave Matthews be on the country station? Because he apparently did a duet with Kenny Chesney. It's number 7 on my playlist. If you hate country, you may not like the first part as much because that's the Kenny Chesney part. But, really, hold on. Dave Matthews' part makes it worth it. Then I was listening to Natalie Merchant's song "Wonder." (Number 8 on the playlist). A friend sent me that song after Liam survived his open heart surgery at two weeks old (there was a very high likelihood that he would not survive it). Anyway, it was one of those songs that would make me smile and cry at the same time. And it's pretty much the best song ever recorded. But it's especially good if you have a child (or know a child) who has had any sort of struggle. I have lots of friends with autistic children who say "Wonder" is their theme song. Finally, I listened to "Dancing in the Moonlight" by King Harvest (Number 9 on the playlist). 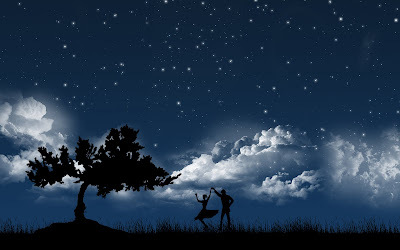 Doesn't it just make you want to dance under the stars with your best friends? P.S. Stop by later for a fun, new lunchtime poll topic.